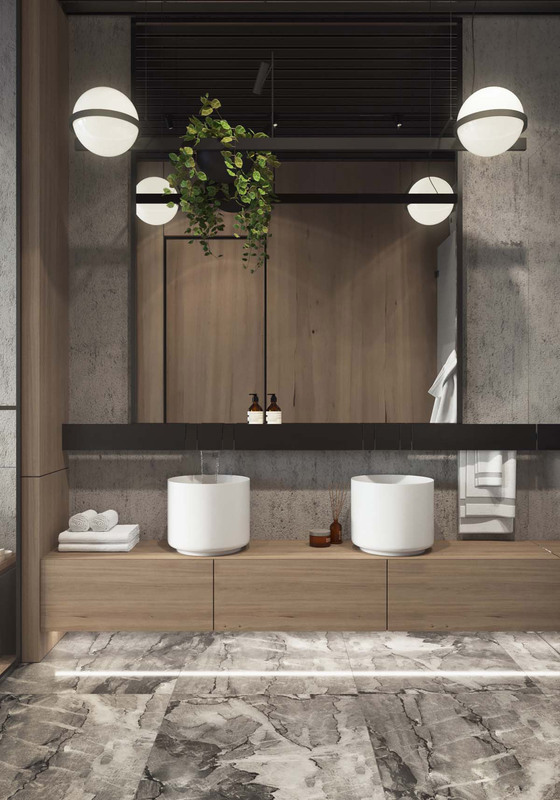 The bathroom is usually a place that is given a clean decor aesthetic, with many schemes revolving around crisp showroom chic. 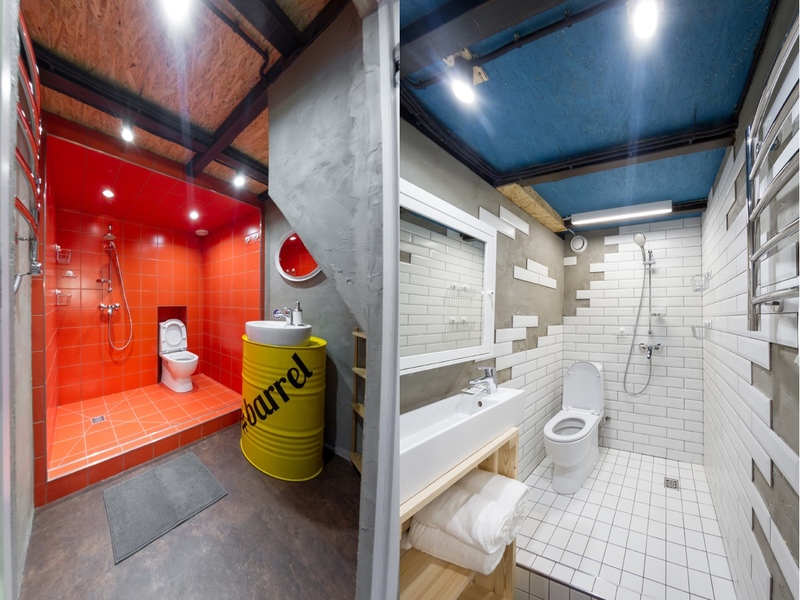 Therefore, introducing industrial home decor to the bathroom can require a little different thinking. 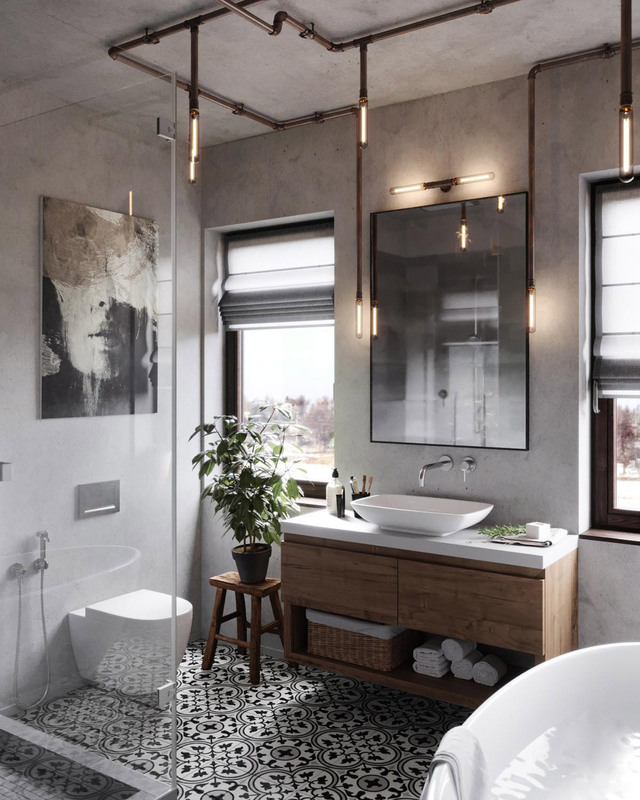 This collection of 51 inspirational industrial style bathrooms shows us how to create this stand out look. Find a mixed bag of ideas and melded themes, plus accessories and cool accents that you can implement in your finishing touches. 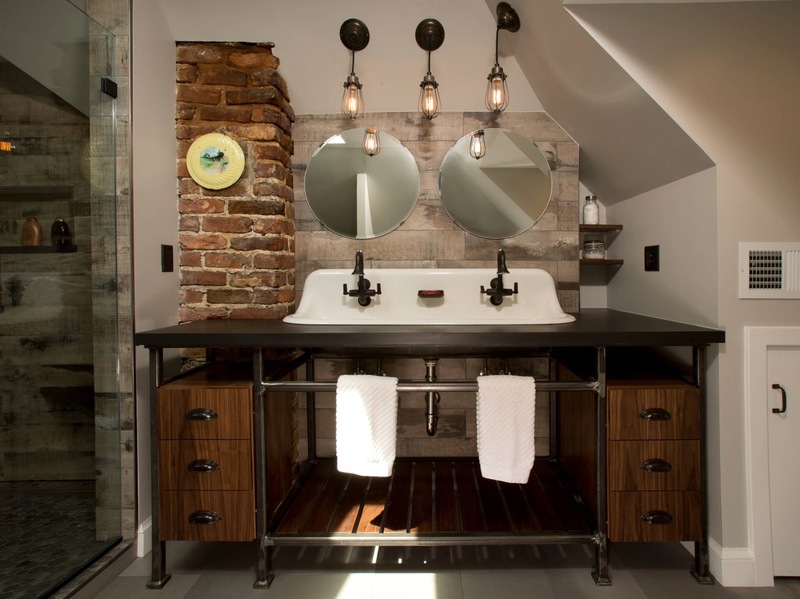 Industrial style vanities, unique sinks, utilitarian faucets, a multitude of mirrors, exposed shelving ideas, rustic cabinets, suitable ceiling lights and wall sconces all abound in this massive selection. Let it all hang out. 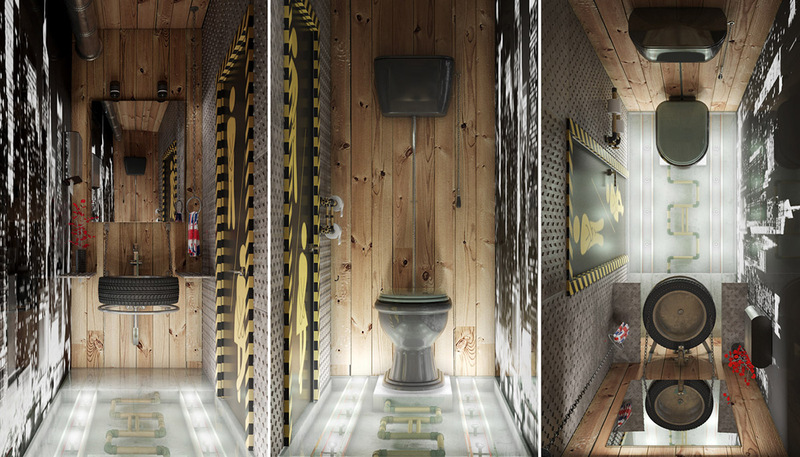 This cloakroom shows off the underfloor piping through a perspex floor, making a standout feature of it rather than hiding it all away under the boards. Add a few extra bends to compose an extra eye-catching pattern. 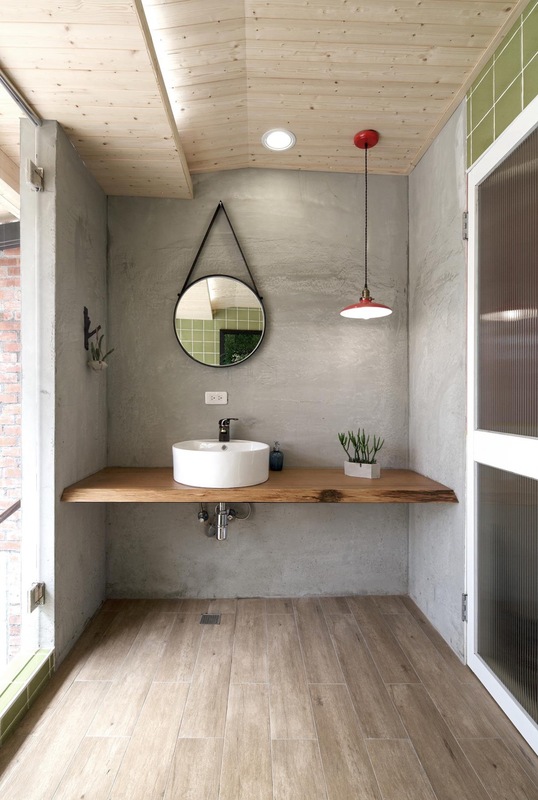 Industrialise the look of a plain mirror. This plain frameless mirror is given more character by suspending the glass from an industrial style hanger. 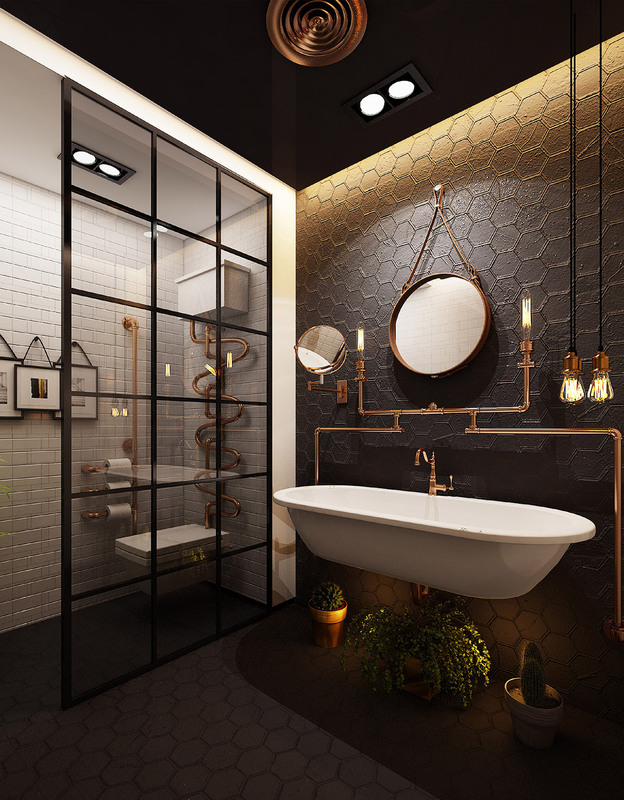 Exposed copper pipes frame the sides, as do the wall lights; you can get similar style wall sconces here . Create a brick wall with tiles. 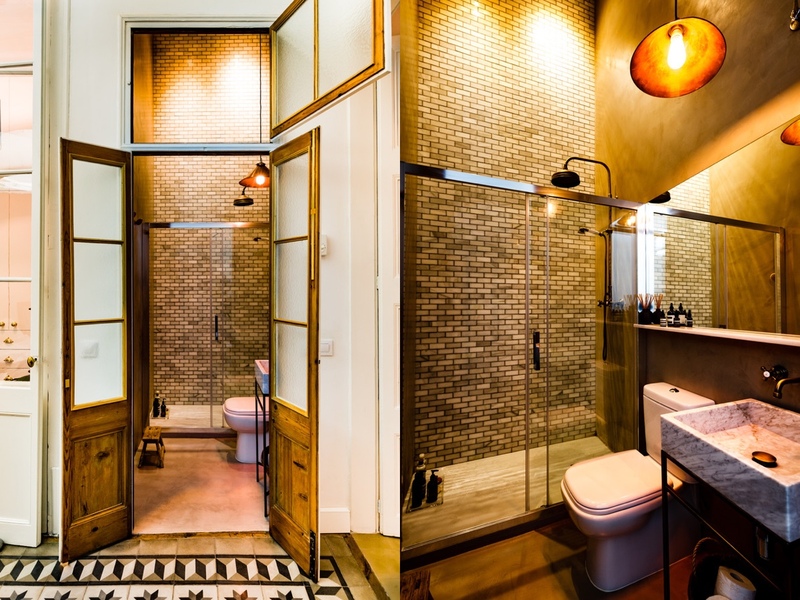 If you’ve not got exposed brickwork in your bathroom, how about creating an alternative with metro tiles or a brick effect shower panel? 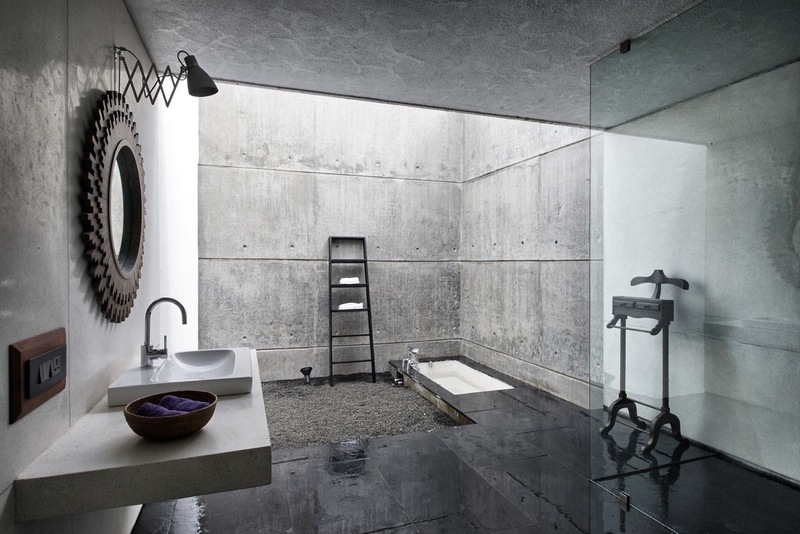 The shower wall pictured here towers right up to the rafters to stunning effect. Follow the upcycling trend. Not only is it great for the environment to save and reuse things that were bound for landfill, but upcycling is a cool way to create a bespoke piece of furniture that you won’t find anywhere else. 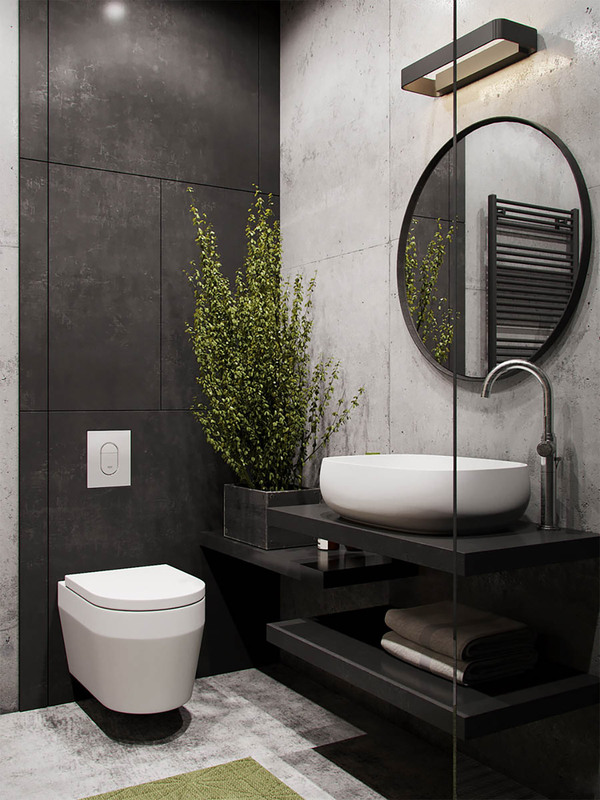 This drum vanity is for sure the hero piece that sets an unmistakably industrial tone in the scheme. Add industrial signage. 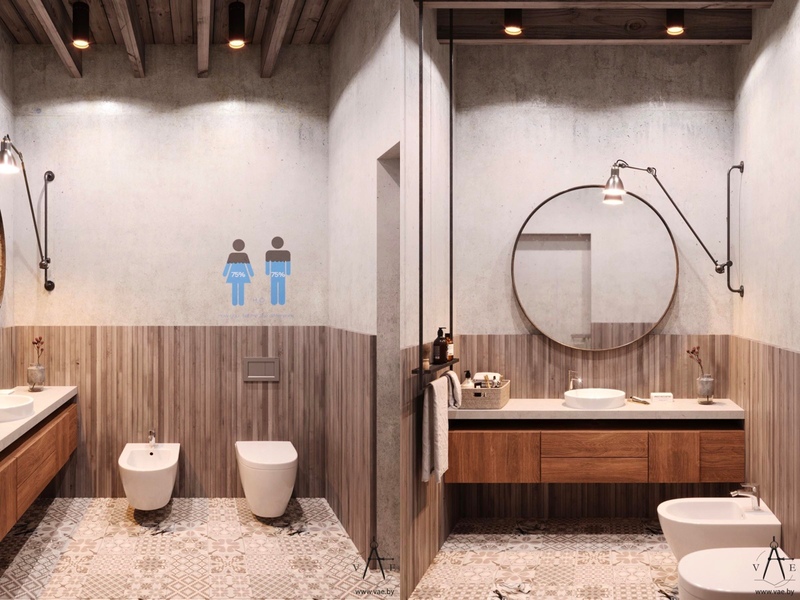 The toilet wall in this bathroom scheme sports industrial designs that might not mean much to read but they do add quirky interest. Use metal framing. Metal framework stands strong as the structure for this bespoke vanity unit and linked shower screen. A more elegant example of industrial furniture framing. This time metal pipework holds sconces at either side of a vanity mirror. 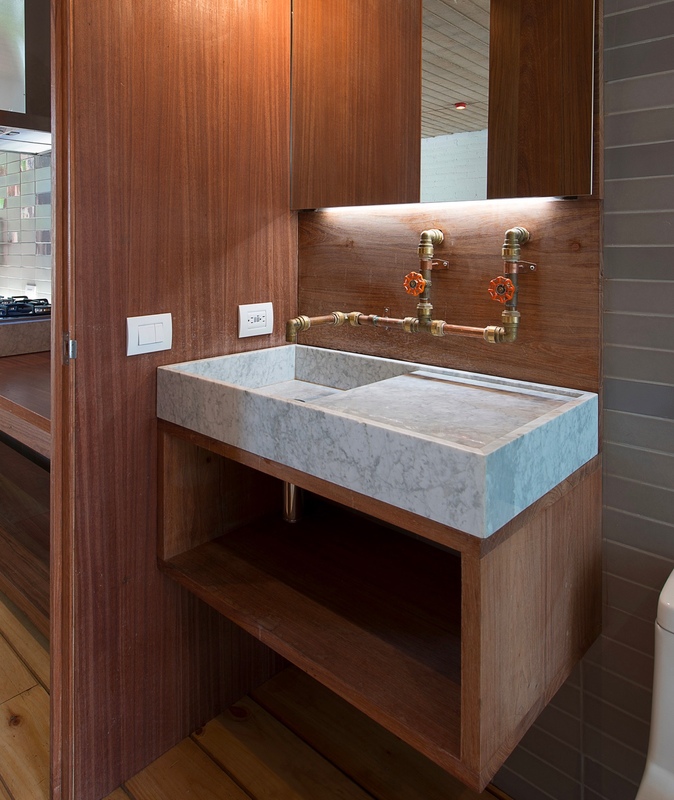 Matching bronze legs support a concrete countertop. You don’t have to be a DIY whizz to enjoy the upcycled aesthetic. 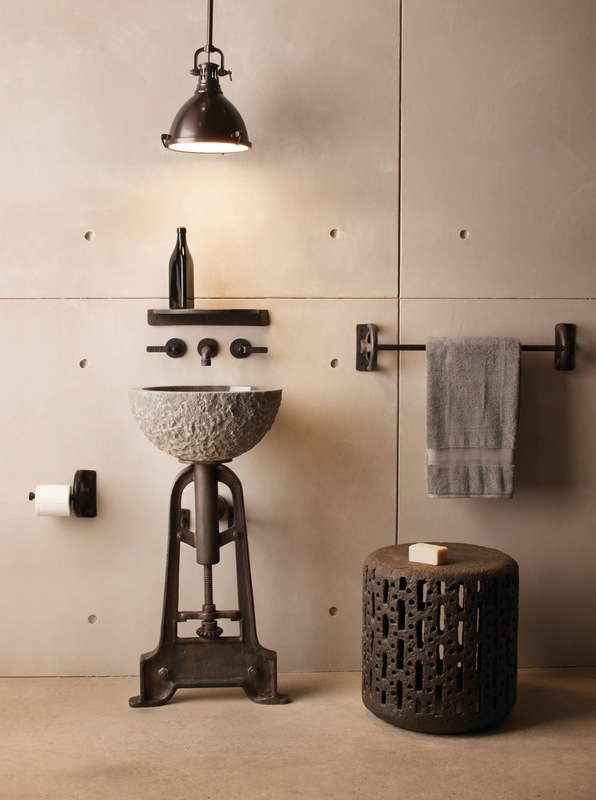 This industrial pedestal design can be purchased online, the sink is from Stone Forest. Go for the trusty concrete accent wall for a tried and tested industrial backdrop. 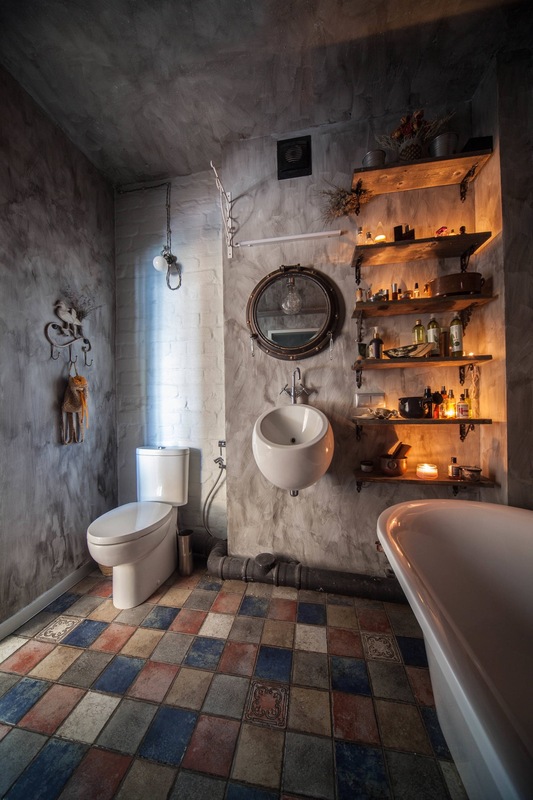 No matter what you put in your bathroom after that, it’s still going to have a cool raw look. If concrete feels cold to you, use it in smaller doses. 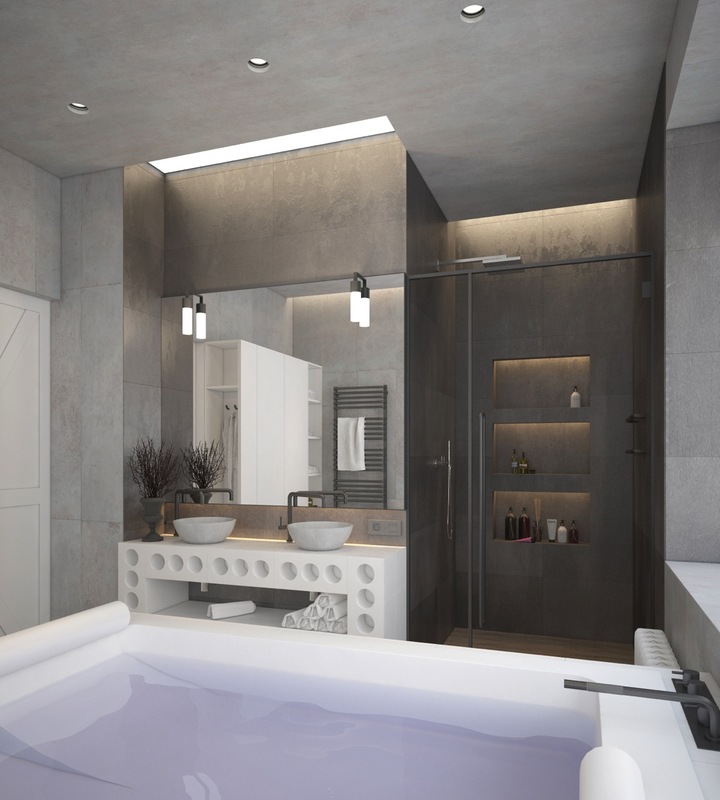 The bath faucet in this design is fixed into a concrete column. 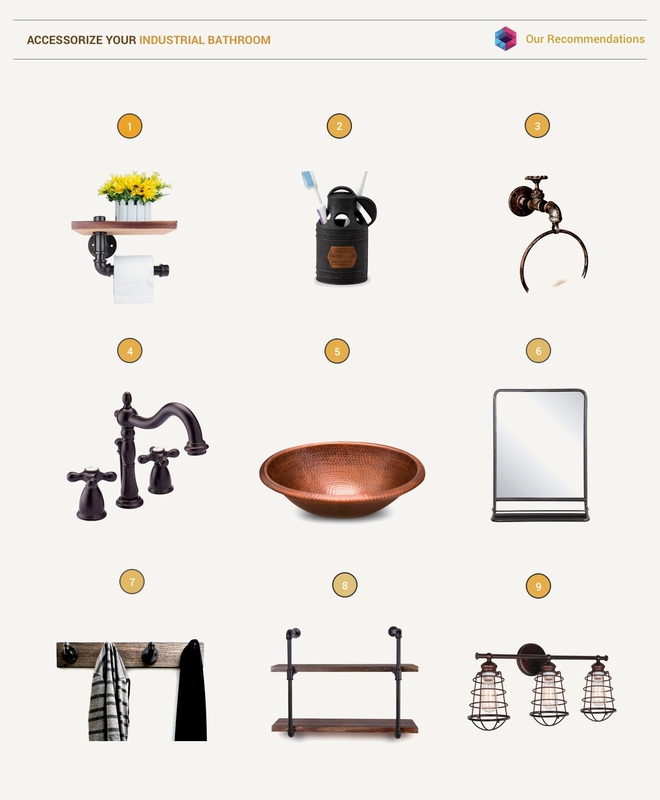 Ditch fancy faucets altogether. 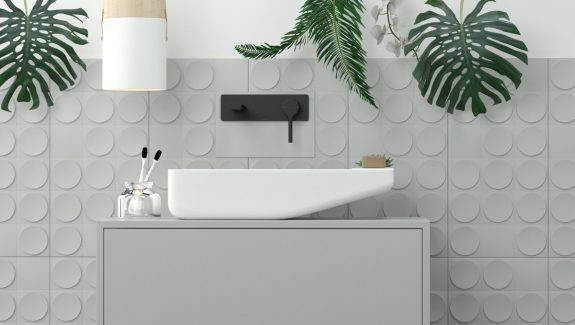 Give the glossy showroom a miss and head down to the plumbers merchants to buy basic bits to create your very own utilitarian tap design – or ask a good plumber to do the job for you. 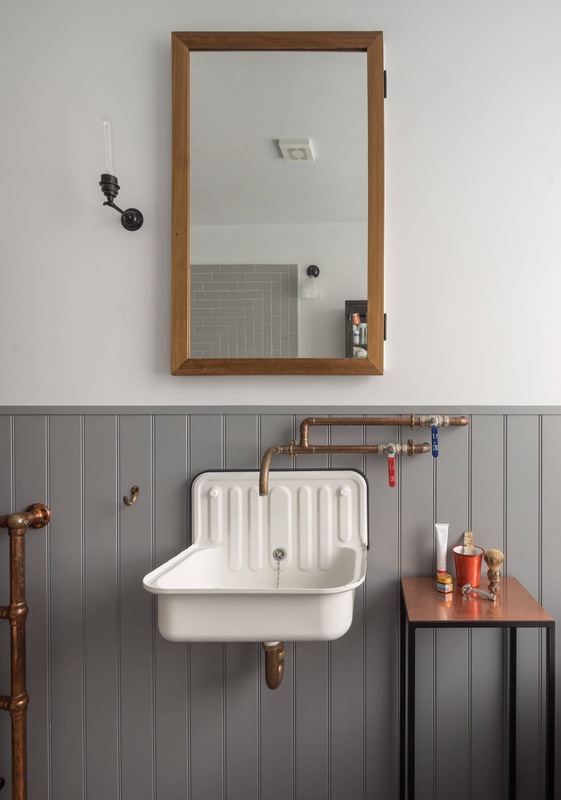 Match your bespoke copper pipe taps with a copper u-bend and towel rail, and maybe throw in a few slicker copper pieces like an on trend side table or pendant light. 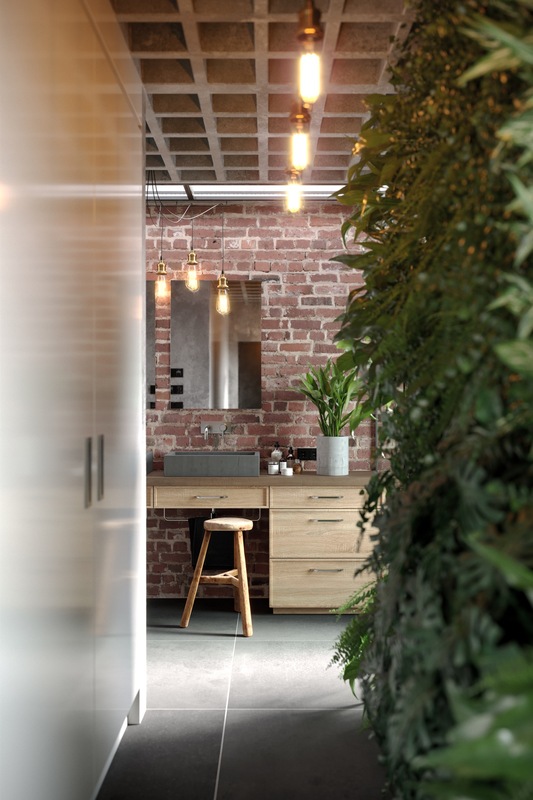 A burst of greenery in an otherwise desaturated space can draw the eye in. 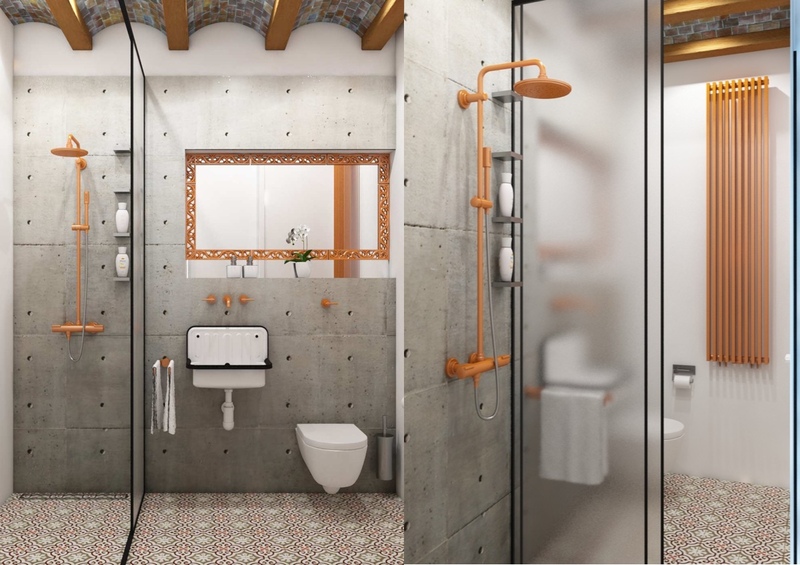 Exposed copper pipework can be used to form shower fittings as well as faucets. 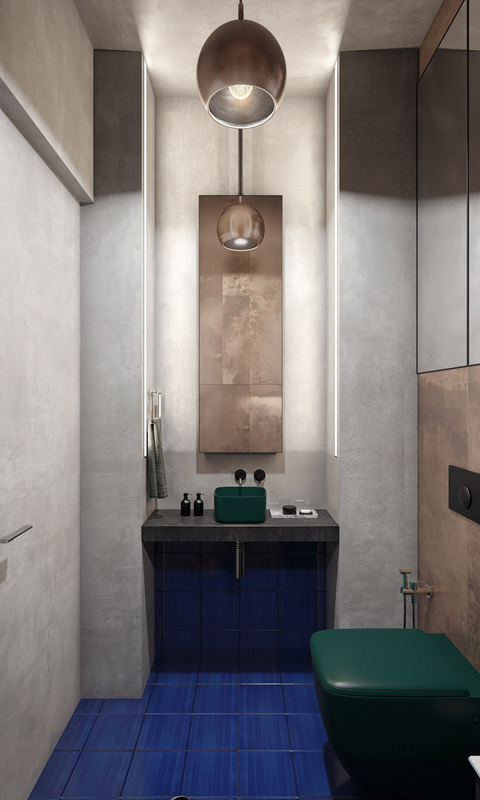 To avoid the effect that your bathroom is simply unfinished, add in sleek matching accent pieces like a copper industrial style vase. A combination of marble and concrete creates winning contrast. Small industrial home accents can go a long way. This double sink bathroom vanity is a simple design but the faucets are a real stand out feature. Matching ones can be found over in the shower enclosure too. Disguise the bathtub in the floor. 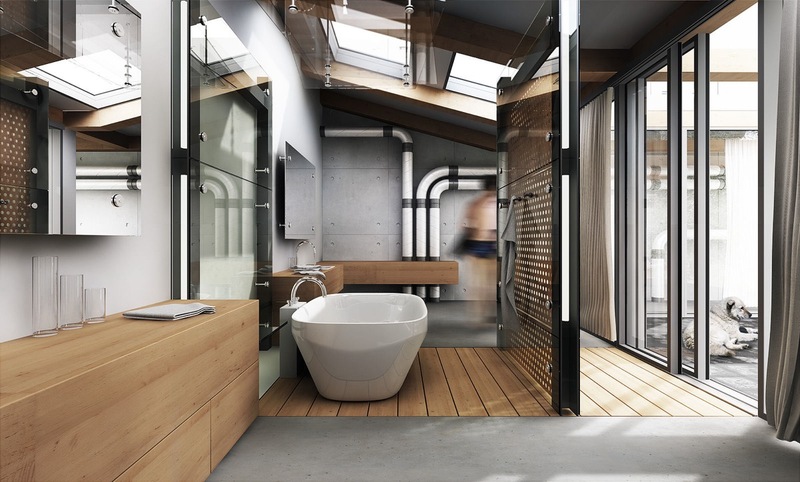 At first glance this bathroom appears as an almost empty space, but a bath is sunken into the subfloor. 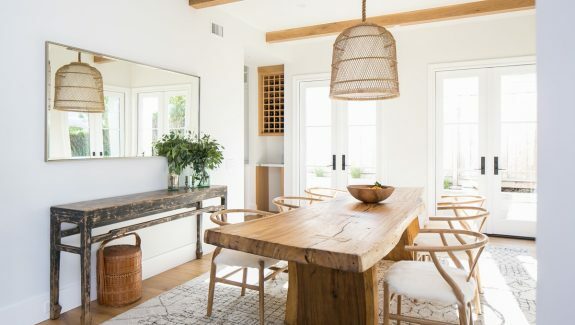 Make an overhead statement with large industrial lights, like the AIM pendants used here. 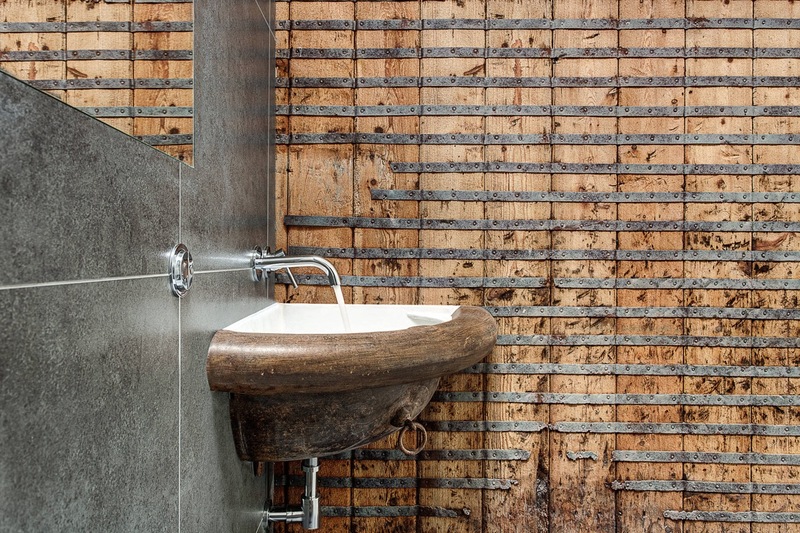 Rustic and industrial decor meld marvellously. If you’re looking to warm up a grey scheme, throw in some chunky wooden elements. 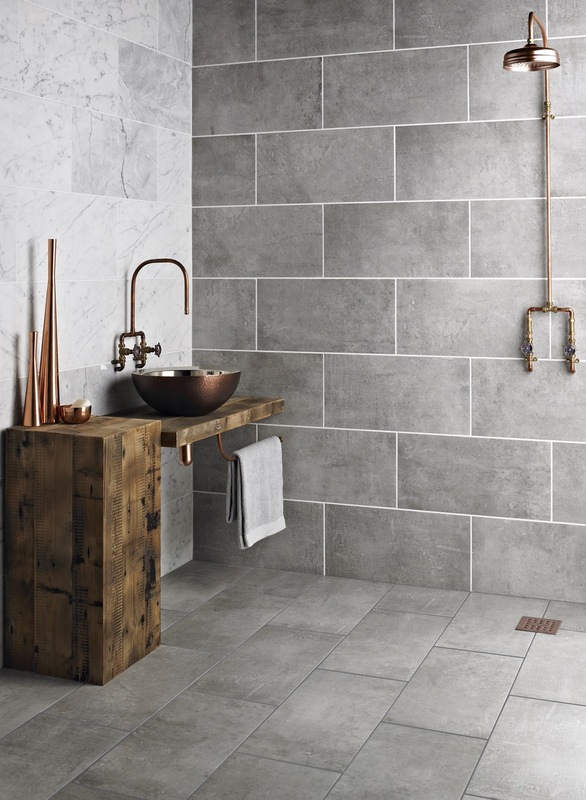 Rustic stone is another way to add warmer colours to your decor without losing the raw industrial edge. 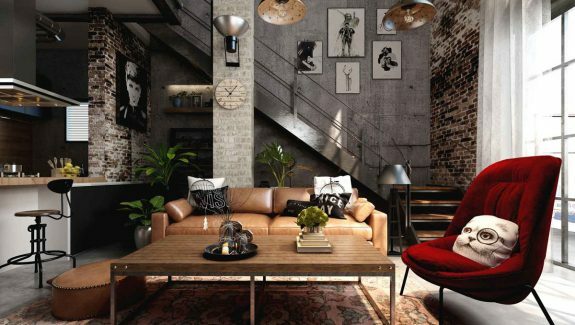 Elegance and industrial do mix. Surprising but true. An industrial scheme doesn’t have to be completely rough and tough. 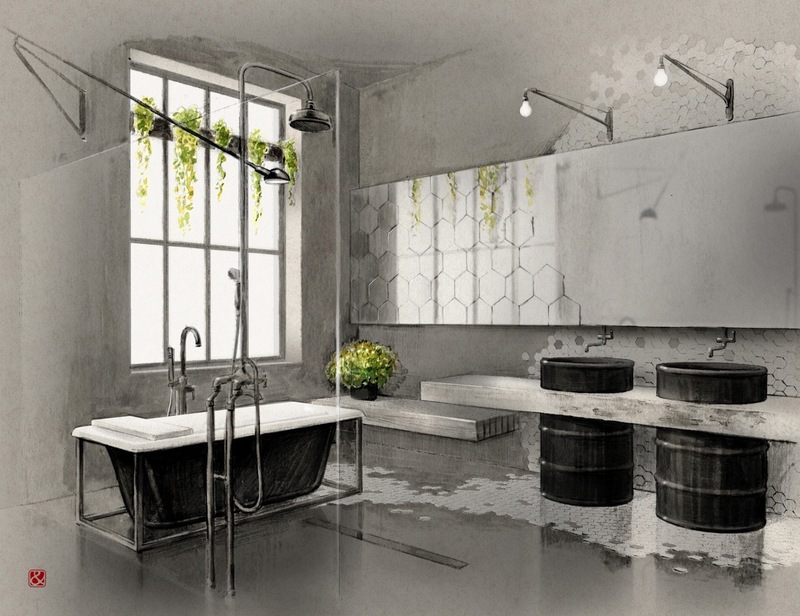 Team the patina of upcycled designs with chic marble countertops and an ethereal palette. Use wire baskets to tidy spare towels and flannels on display. Art is life. This amazing design positions geo tiles to appear in a state of decay. A unique wall mirror replicates the effect. Use accessories to lift the look. 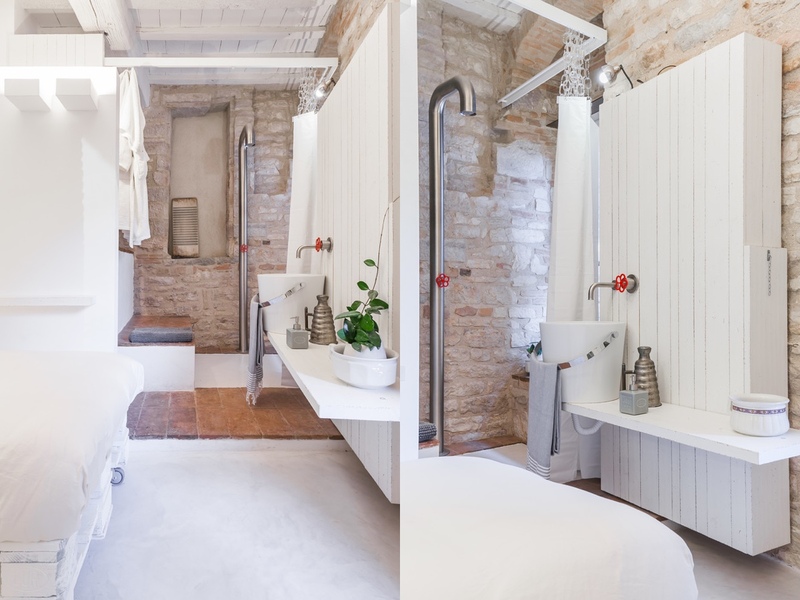 Gold fixtures look rich and inviting against cold concrete and whitewashed brick surrounds. Indoor plants breathe in life. 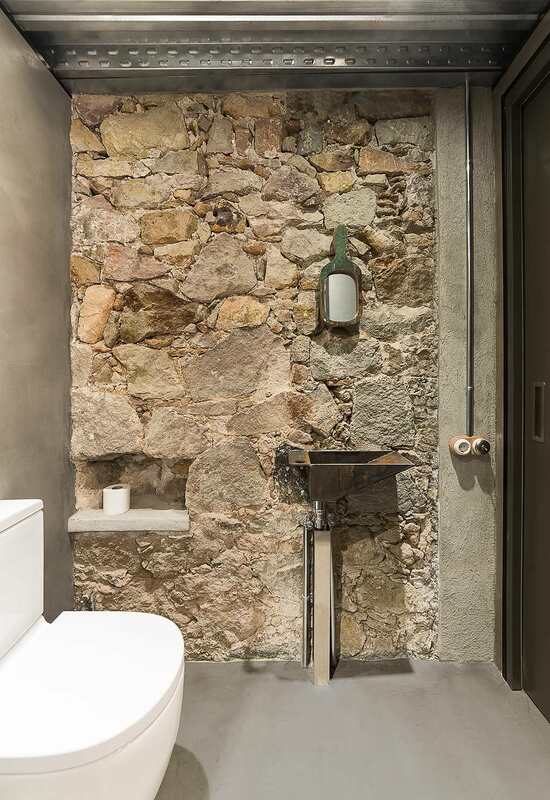 A floating false wall can conceal extra pipework on stone feature walls. 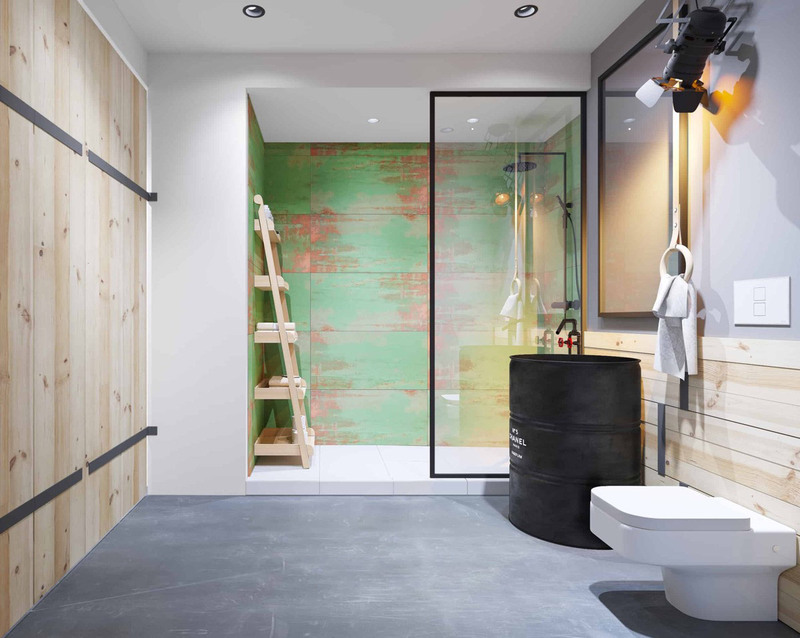 If you don’t want to let it all hang out – the pipework that is – build a floating false wall with wood panels to hold the waterworks, and create an attractive feature while you’re at it. Don’t tuck away the electrical wring. If you want to hang a light over the other side of the room to where your current ceiling outlet is situated, don’t sweat it. Having cable strewn across the ceiling is all part of the master plan. 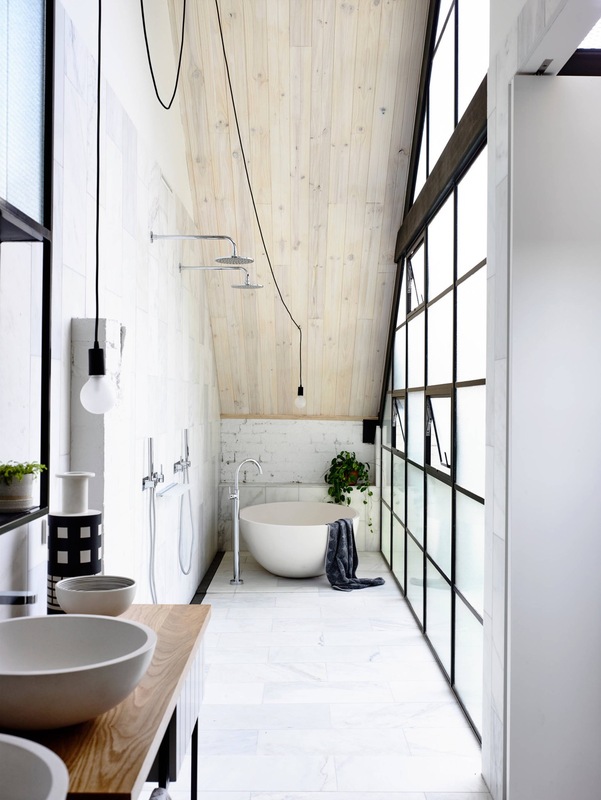 Darken down a basic white scheme with black window frames, black showerhead and matching curtain rail. In colder decor schemes, the lighting plan becomes even more important. Use warm white LEDs to create a cosy glow around the edges and in shelving niches. Chrome pipe descending straight out of the ceiling shoots water down into this industrial style basin. 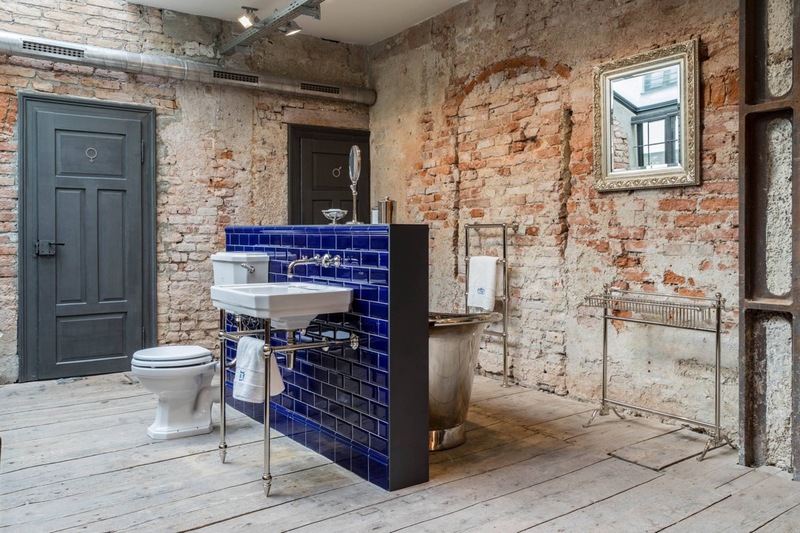 Shiny chrome bathroom furniture really pings against red brick accent walls. 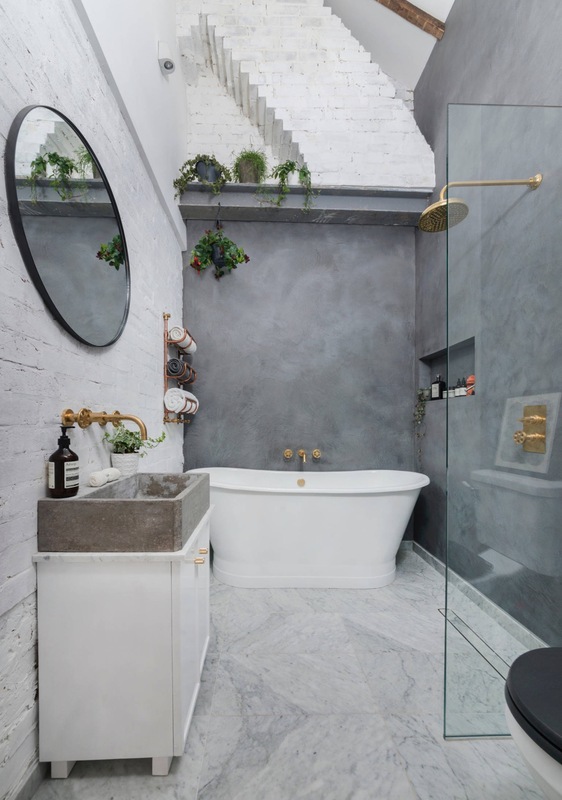 Suspend an industrial style pendant light over a freestanding slipper bathtub for some old school glamour. 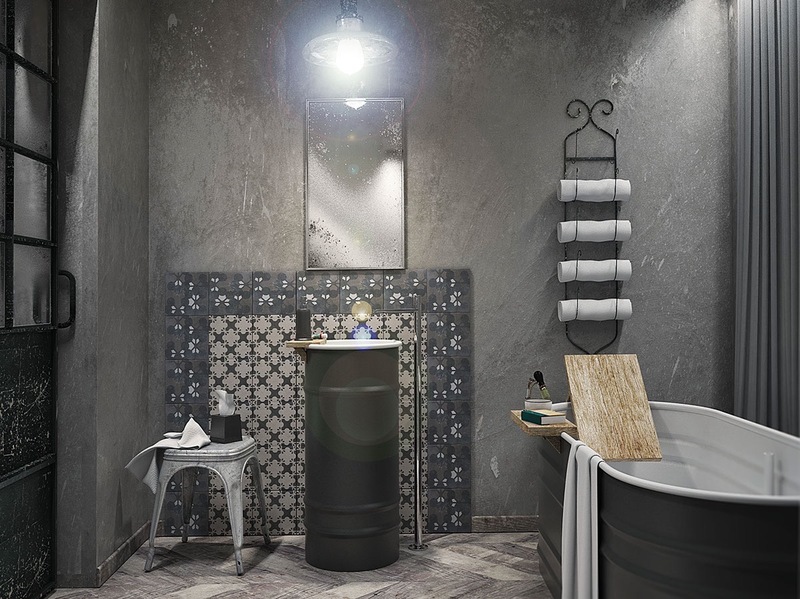 Don’t think pretty tiles have a place in an industrial setting? Think again. 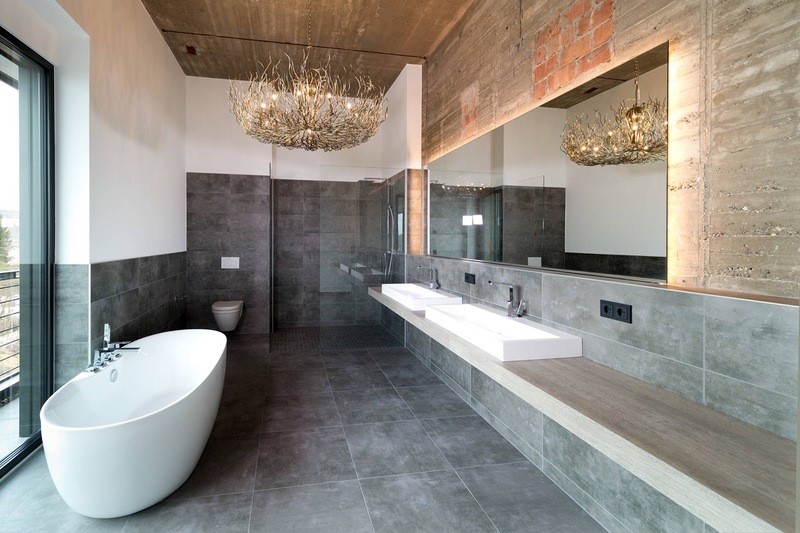 A new take on the traditional can be achieved by setting patterned tiles on raw concrete. 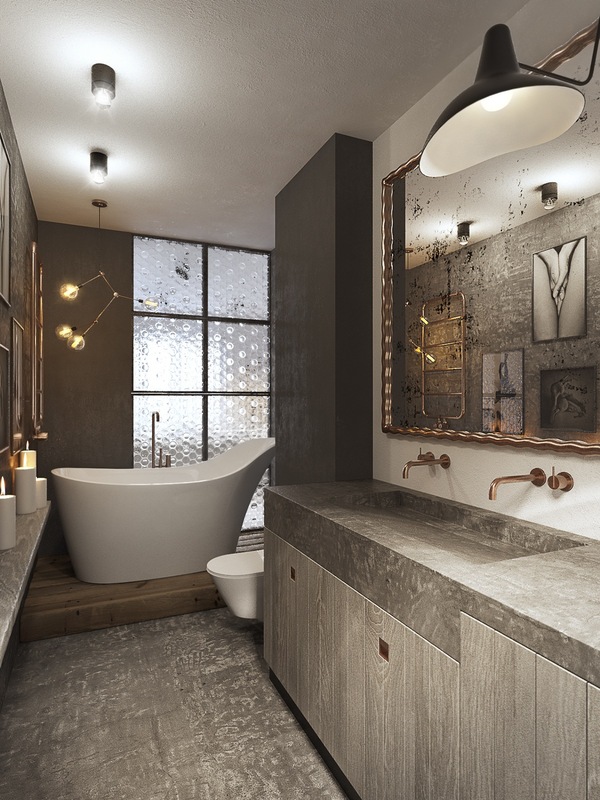 Why go just A-Z with copper pipework when you can swirl and streak all around the room. Vintage edison bulbs are a great accessory to the industrial decor trend. 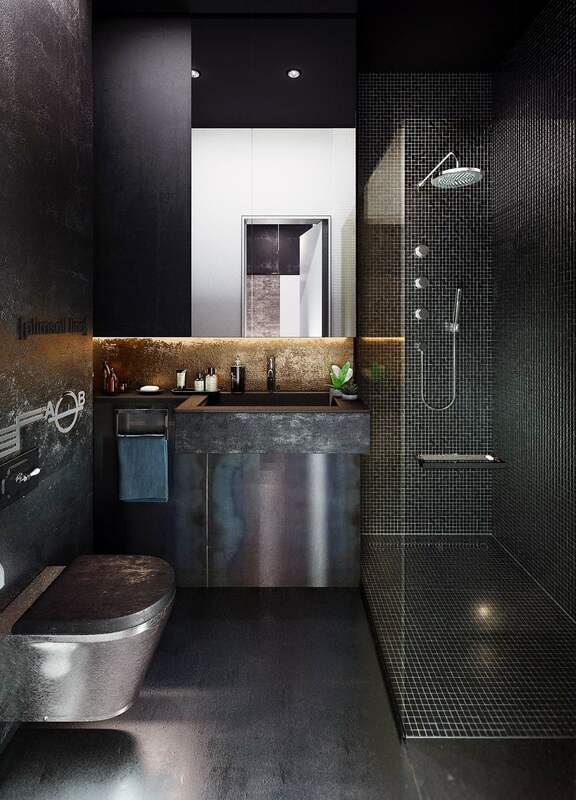 Consider choosing reflective surfaces if decorating a narrow bathroom space in darker colours. The reflections will make the space seem wider than it is. 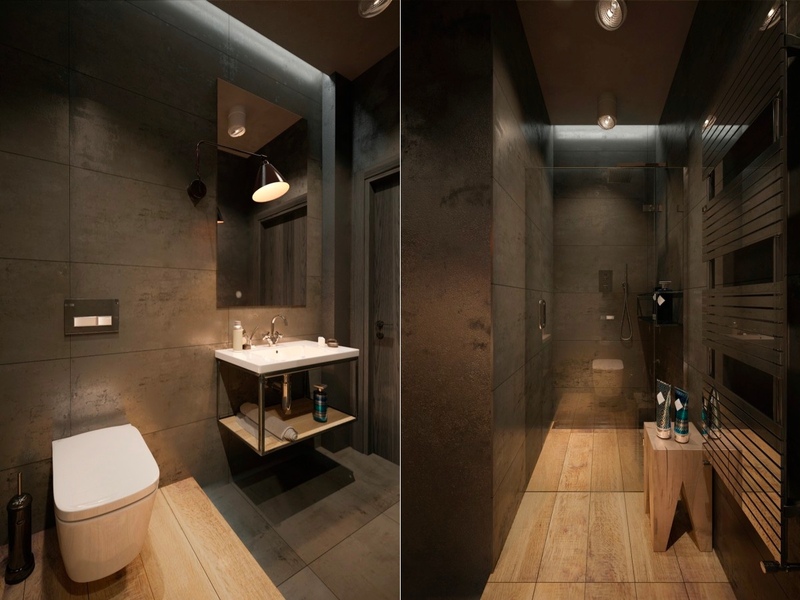 Install a bespoke industrial style lighting track. Use a network of pipes to draw a unique design all over your ceiling and descend lights at varying levels. Balance out the room with an equally eye-catching floor tile. 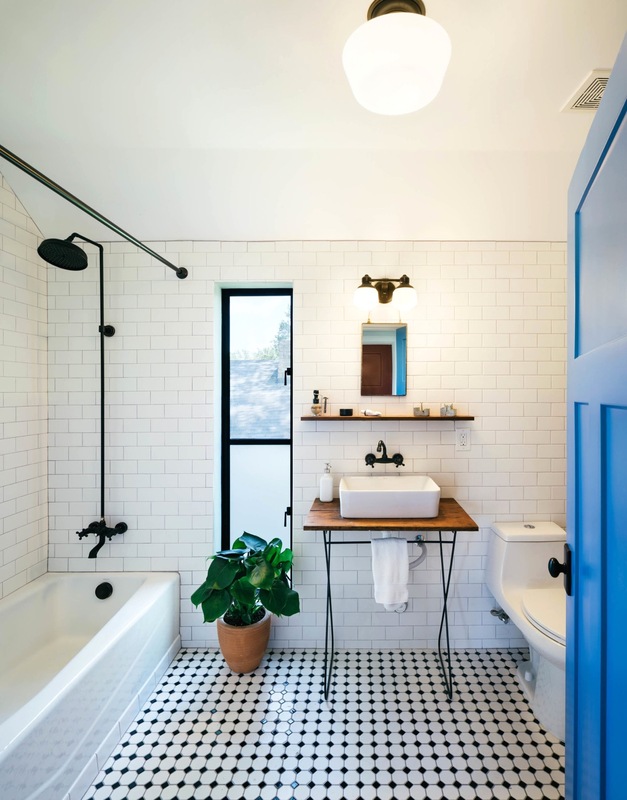 Raw walls and floorboards might lack colour, but a blast of cobalt blue tile and a petrol blue door pull this scheme up by the bootstraps. 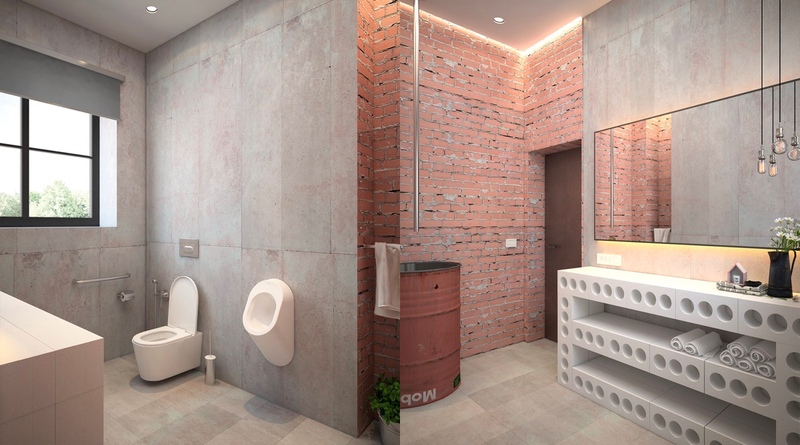 Concrete walls, exposed pipes, perforated panels, skylight… this one ticks all the right boxes. 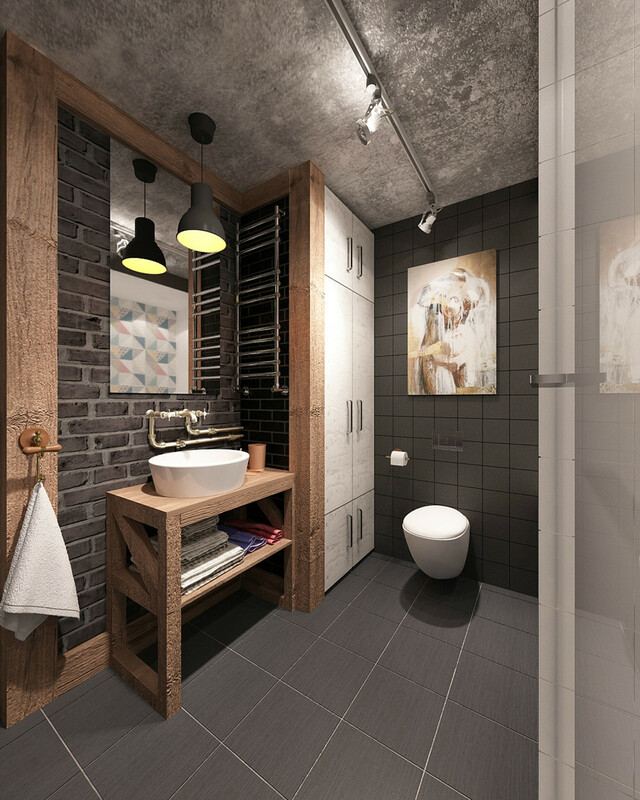 Open bathroom shelving adds personality. Scatter tea lights around the shelves to create a cosy glow when relaxing in the tub. Embrace flaws. 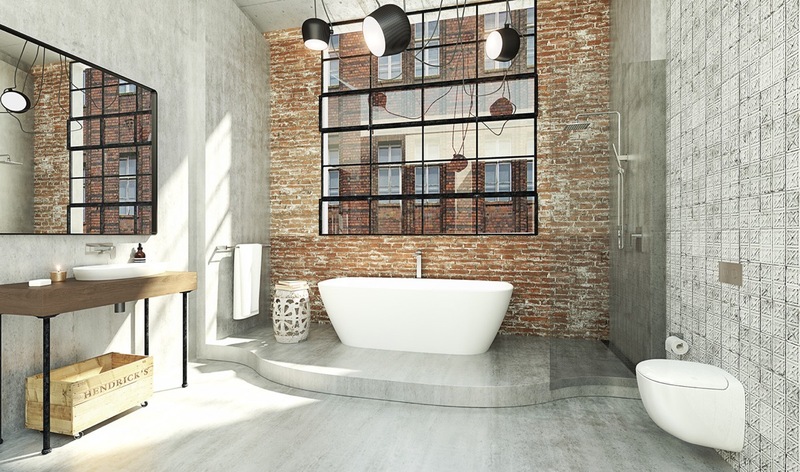 The industrial look has the benefit of not requiring a pristine, ultra symmetrical finish. Enjoy the quirks that a room may present, and play up to them rather than attempting to disguise them. Add shine to imperfections. 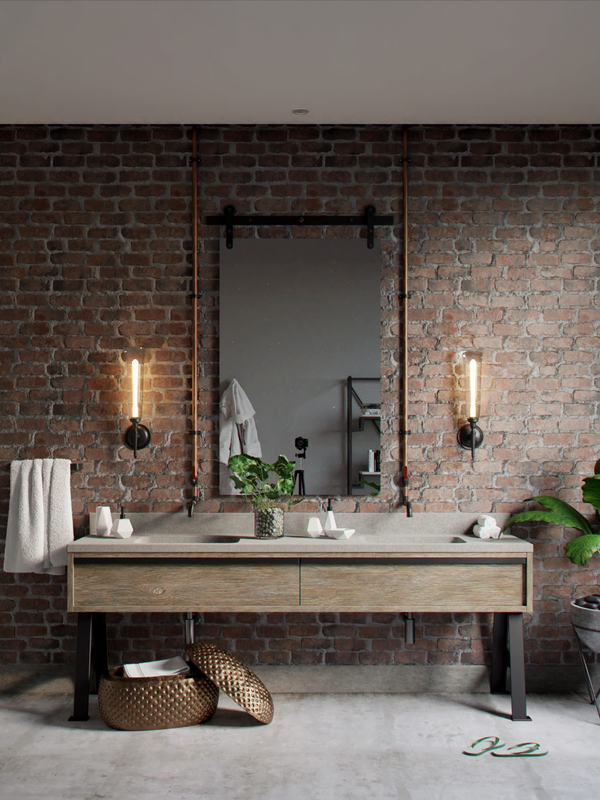 Balance out a feature wall of industrial imperfections with slicker sections of decor and bathroom furniture. 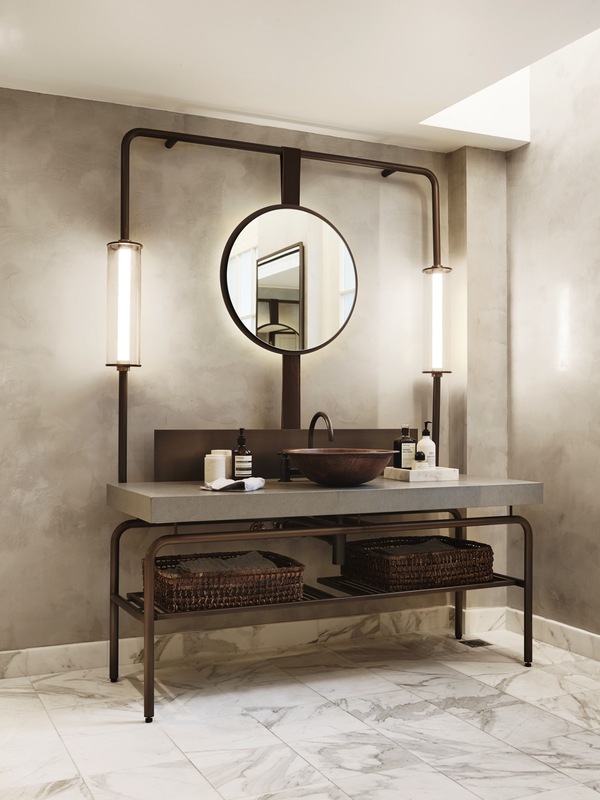 A swing arm wall lamp provides repositional lighting over a vanity. 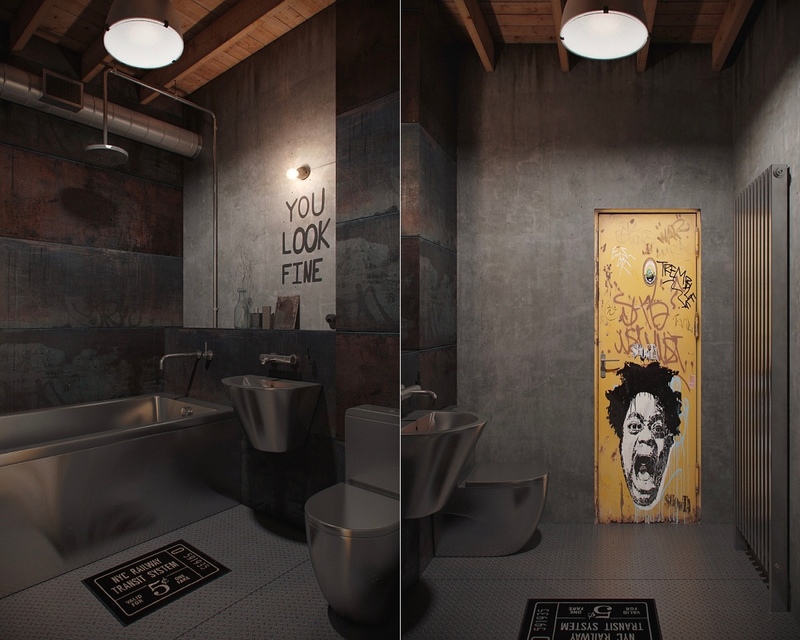 If you don’t mind a little public bathroom chic: try stainless steel bathroom furniture and a splash of graffiti. 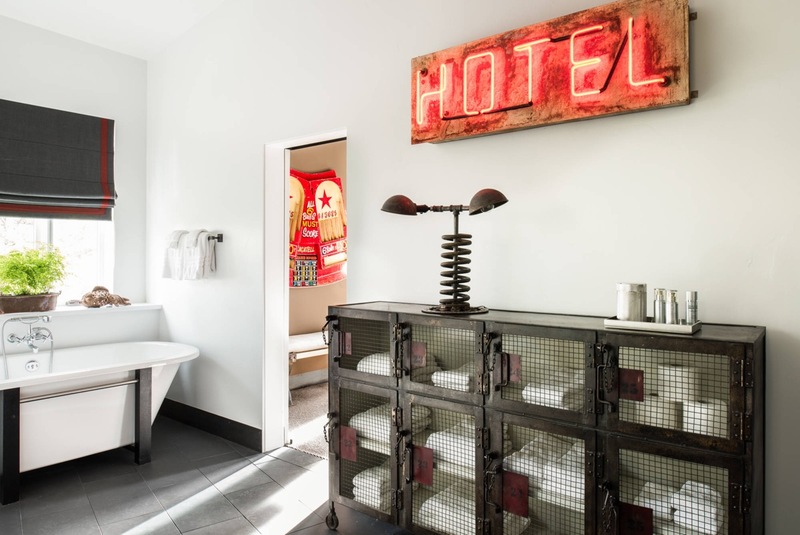 A quirky neon sign makes unusual bathroom wall decor above an upcycled hutch here. Bathroom towels and spare toilet rolls are on display behind wire covered doors. 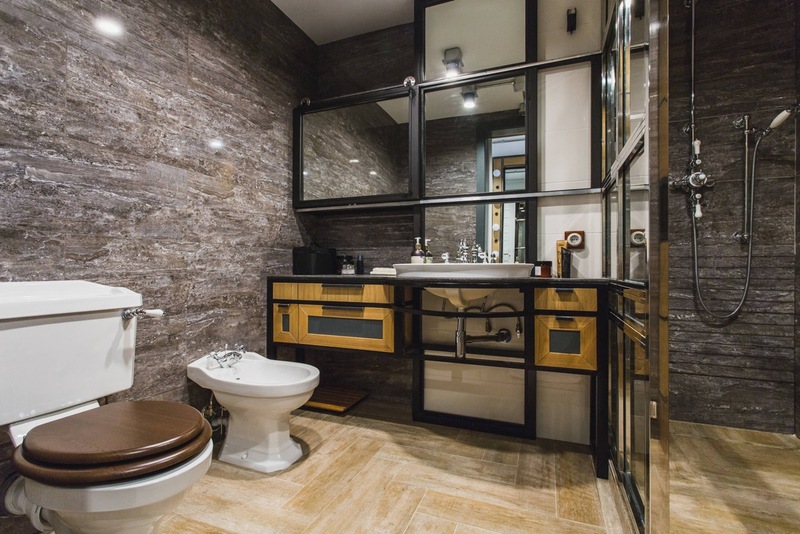 Wooden bath mats provide a warm spot to stand on a concrete floor. … Jewel tones work well too. Use unexpected found objects to personalise your room. Consider things you might find around a garage like a license plate or bicycle tyre, or think street signs and metal mail boxes. You can update a scheme with just a few new pieces. 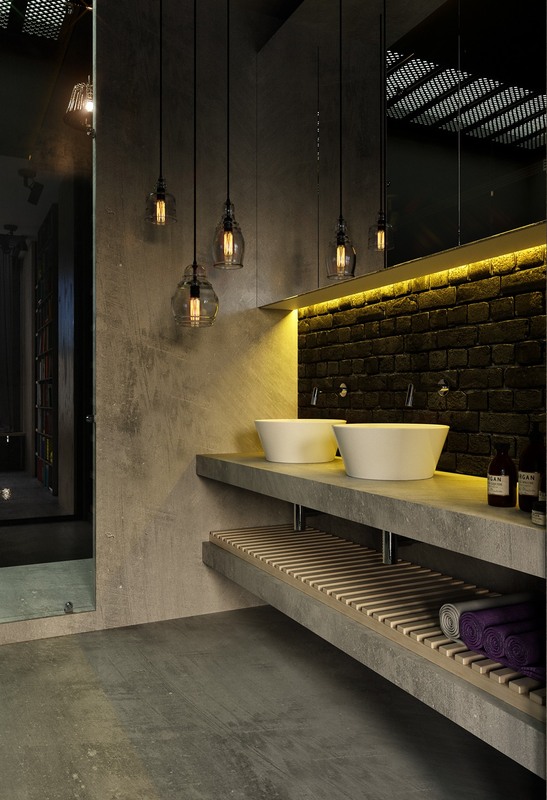 A concrete basin adds industrial panache to the top of a regular wooden vanity unit. A chunky planter complements the look. Do it yourself. 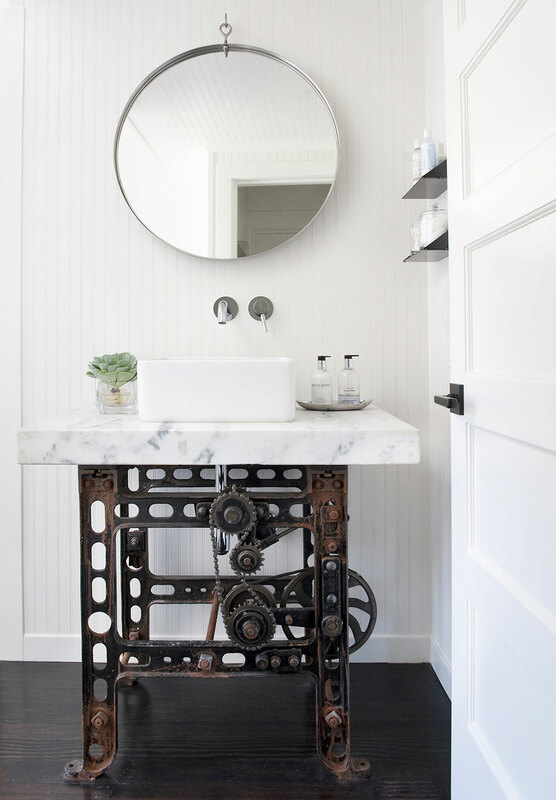 If you have woodworking skills you could fashion an effective DIY industrial bathroom vanity pretty simply and on a budget. Be selective. 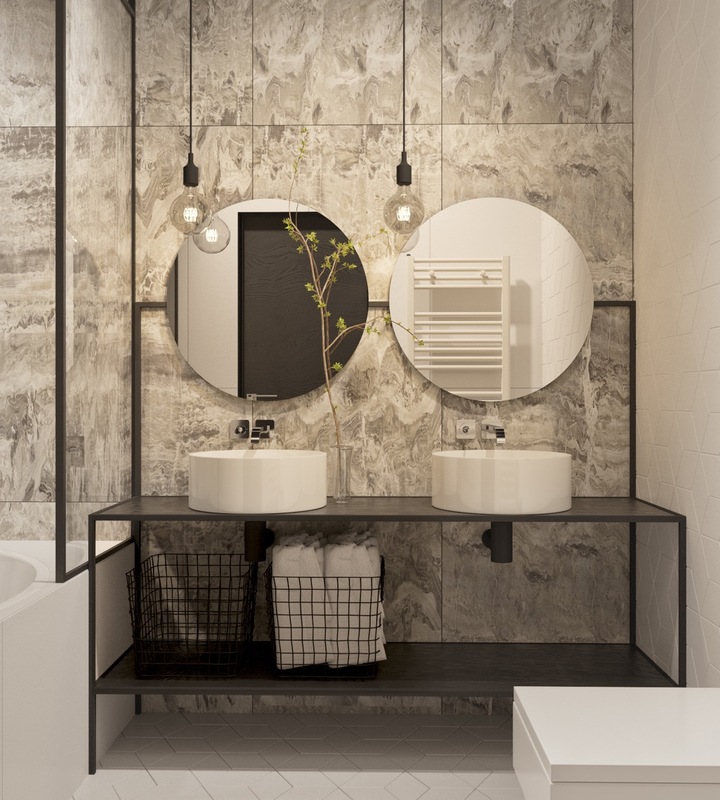 A mirror design that is mounted by a leather strap looks in keeping with an industrial bathroom scheme, and makes a smart addition against a textured concrete wall. 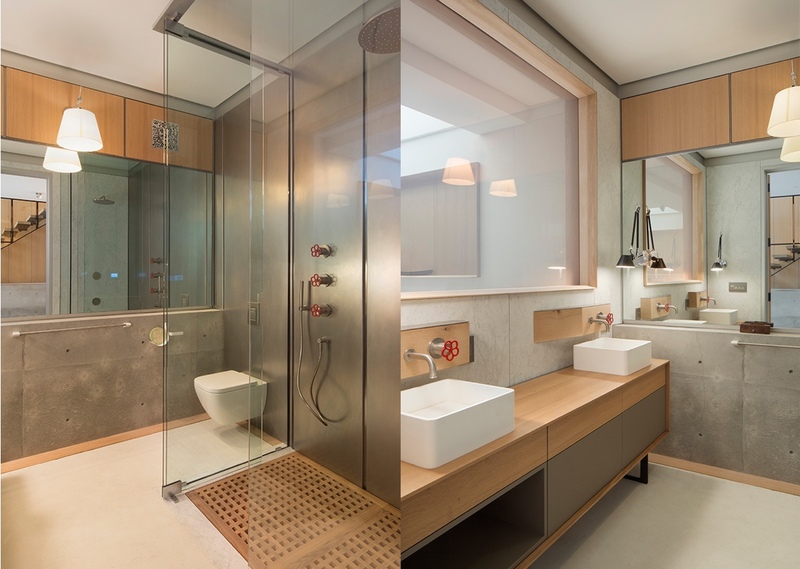 This bathroom also has a red pendant light hung over the vanity to bring in a refreshing slice of colour.